It’s so hard to make a show about nothing. 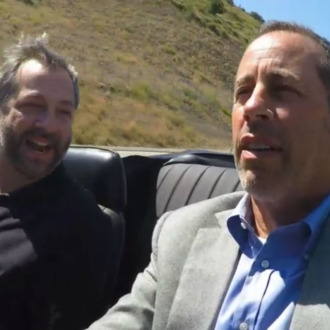 In this episode of Comedians in Cars Getting Coffee, Jerry Seinfeld picks up Judd Apatow to get some burgers and shakes, and yeah, coffee. But before that, they rummage through Apatow’s memory pile, they come upon things like Garry Shandling’s Rolodex and joke book. Apatow interviewed Shandling as a kid in the ‘80s (it became a part of his collection Sick in the Head) and then later worked on The Larry Sanders Show. But that’s not what gets the tears going. At the diner, Apatow remembers Shandling’s memorial service, where “every person who spoke killed” simply by recalling things that Shandling had told them. “People responded at Garry’s memorial to you and Garry in a big way,” Apatow tells Seinfeld. “There’s something about him that encompasses the human struggle. He was trying so hard to be happy, and to find peace, and to let go of his ego.” And not even the mighty Jerry Seinfeld can hold back a tear. What’s with all restaurants these days? Why do they always keep them so dusty?